When you’re applying for jobs, an employer may request a copy of your high school, college or graduate school transcript as part of your job application. Review information on official transcripts, unofficial transcriptions, how to request transcripts, and how to provide copies to prospective employers. An official transcript is a list of the classes taken by a student, along with grades, and GPA (Grade Point Average). A transcript will list all courses and grades received, majors, concentrations, any honors, and any degrees earned by a student. Most students can access an unofficial transcript on their school’s online portal, but most employers require a more official document. An official transcript is typically issued by the school’s Guidance or Registrar’s office with an official seal or signature. Here’s how to request a copy of your official transcript. Transcripts that have been handled by students or anyone in the absence of a seal or closed envelope are considered unofficial. Unofficial transcripts are printed on regular paper and are usually free and instantaneously accessible. Unofficial transcripts can often be used as a temporary placeholder while waiting for the official transcript to arrive. These transcripts will still describe coursework and any transfer credits, academic standing, disciplinary action, honors, and how the coursework aligns with certain degrees and career paths. In the case of incomplete education or waiting for final scores, unofficial transcripts will list CIP (course in progress) to describe a course that has yet to receive a grade. 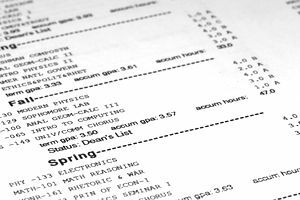 If an unofficial transcript is requested, it is acceptable to send a photocopy of a grade report or a downloaded copy of a transcript, as long as it contains all your coursework, grades, and GPA. When employers require an official transcript, it must be requested by the student or alumnus and sent directly from the high school or college. The issuing institution will normally send it directly to the employer to prevent any potential tampering with the document. A transcript can be considered void or fraudulent if the seal is broken or opened before the employer receives it. High school students and graduates should contact the guidance office, and college students and graduates should contact the registrar to have an official transcript sent. Many schools require that alumni have no outstanding balances owed to the school. If there are, they reserve the right to withhold your official transcripts until the balance has been paid. Some schools require a written request before they will issue the document, but many offer an electronic alternative. Both ways of requesting may require the student to disclose proof of identity with signatures, social security number, student ID numbers, and date of attendance. Official transcripts are usually issued with a nominal fee anywhere from $5–$30, excluding shipping, depending on the institution. The Family Education Rights and Privacy Act (FERPA) provides students with the right to access their education records, regardless of obstacles preventing them from obtaining them in person. Colleges and universities are required to provide students with a copy of their education records even if the student does not live in the area or is otherwise unable to visit the school in person. Although many schools prefer that students submit a formal, in-person request for a transcript, FERPA requires them to mail or otherwise send education documents regardless of the student’s proximity. This copy, however, does not need to be an official transcript, and the law does not require that institutions send anything to third-party vendors or employers. ABC Corporation requires a resume, cover letter, writing sample, and official transcript from applicants for the management training program. The company required an official transcript in addition to a copy of the degree to ensure that candidates had the appropriate background for the position. John sent a copy of his unofficial transcript to the hiring manager as a proxy until the official transcript arrived.